Building machinery maker Komatsu will bring its "smart" construction know-how into forestry operations, harnessing both drones and information and communication technology-equipped logging machines to improve efficiency by about 10 times. 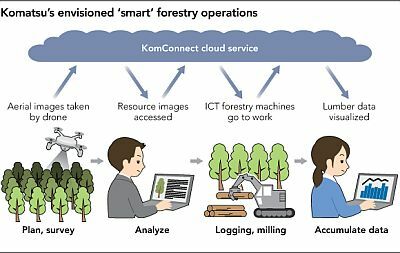 Verification testing on the so-called "smart forestry" concept has recently started in central Japanese prefecture of Ishikawa. Images of a forest taken in 3-D by a drone will help analyze the concentration of trees, as well as their height and locations. While managing the terrain and machinery data via the cloud, Komatsu's harvester -- a hydraulic excavator with logging and delimbing functions -- will be deployed to fell trees. The mechanization of surveying and logging operations that have hitherto been done manually will contribute to labour saving. In the past, it took a day to survey a hectare of land, a task that involved four to five workers. A drone could finish the same process in half a day, and only one worker -- who will control the vehicle -- would be needed. The logging process, which now requires more than 10 workers, would only need one worker under the smart forestry concept, meaning the new system would boost the efficiency of each task by around 10 times. Komatsu is working to put the system into practical application as early as possible because: "Even though many manmade forests reach the perfect time for timber harvest, logging often does not proceed due to the labour shortage in Japan," said Kiyoshi Mizuhara, a Komatsu senior executive officer. In Europe, which pioneered the mechanisation of forestry operations, Komatsu will bolster the ICT functions for forestry machinery. The company plans to expand the productivity improvement services and maintenance contracts for forestry companies using the MaxiFleet service which manages data on machine's operational status.